The sport sedan is my favorite kind of car. You can have your McLaren, if I can have four doors and a long hood. One with the proportions of a C-class, the suspension of the ATS, the engine of a Mazda 6, the suede interior of the M3, and the value of the G70. Don’t worry about me, I’ll be set. 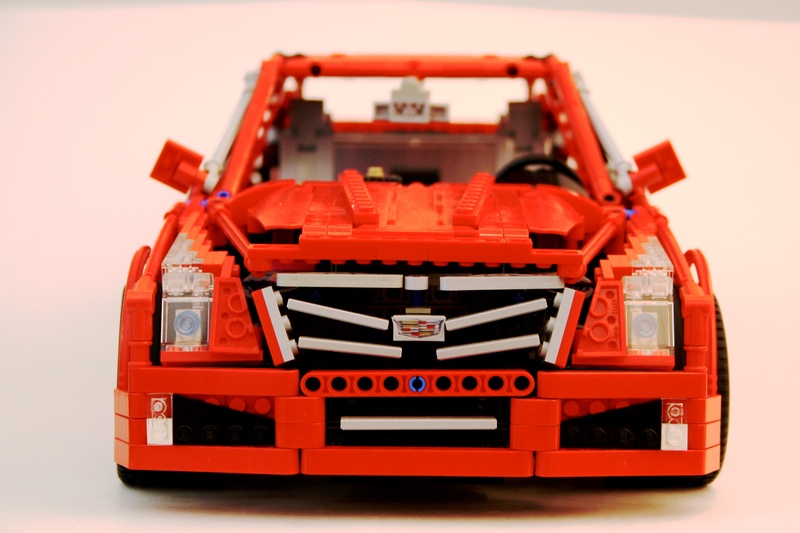 But there are few good sedans in LEGO, and even fewer smaller ones. Let’s change that. Instructions may be downloaded here. When I set out to make a sedan, I wanted it to be smaller. What were the features I could add in a smaller LEGO car? It had to have some style, suspension, a gutsy engine, steering, and a transmission. Finally, it had to be strong. So I got to work. The scale was set on a 3 Series that was a little wide, so I set the hardpoints and set off to work. I first set the two axles and suspension. I have built a couple cars with a floating rear differential, and this setup has worked well in the past, so it would work well for this car. Each side had a dual arm independent setup with two shock absorbers. The front suspension used a dual A-arm setup and a wheel hub with only one hard shock absorber. Before adding the steering, the driveline would need to be finalized. I played around with a number of transmissions, but settled on a simple two speed design for a number of reasons. First, it was smallest as something else would take a lot of space from the interior. Second, something better would take away from the rigidity of the model. Sedans need a lot of support through the transmission tunnel as you lose a lot of rigidity near the doors. 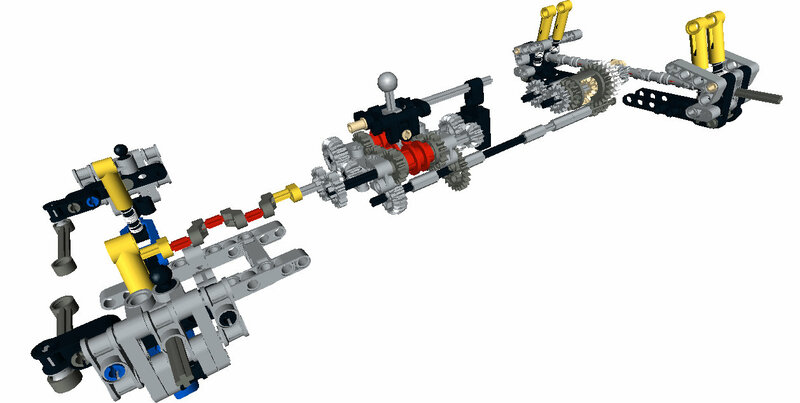 Finally, anything more complicated than 2 speeds would be tricky to manually operate (play with) in this scale. About half way through my work on this project, some fun new gears came out which improved the design. Next, I moved on to the bodywork. This is the part that causes me the most problems in my car builds, and this car was no exception. I set the doors first as I wanted to use two panels for each side. Then I worked on the front and rear bumpers. The rear came together quickly, but the front took a little more time. I wanted something that was sporty, and with a simple grill. I think it worked out well. Finally was the roof and the rear quarter panels. This part took a long time, as I wanted something strong and stylish. The result is strong and has the C pillar split into a D pillar. It is not perfect, but it is stronger than all the panel ideas I tried. After the bodywork was set I did something I have never done before, I rebuilt a second whole car. This time, I knew all the final features, and where all the body work would attach so I could focus on creating a strong frame that would best support the whole design. I am happy I did this, as it cleaned up the inside, found some new solutions, and made the whole car stronger. Building this way also helped me think through how clear instructions could be made. In the end, I was pleased with the final design. It accomplished all the goals I wanted, and it is an accessible design for others to recreate. I love building in this scale, and cars are a lot of fun, so I will need to do another small car design again. Until the next time, happy building. A while ago I decided I was going to do a proper new school supercar. 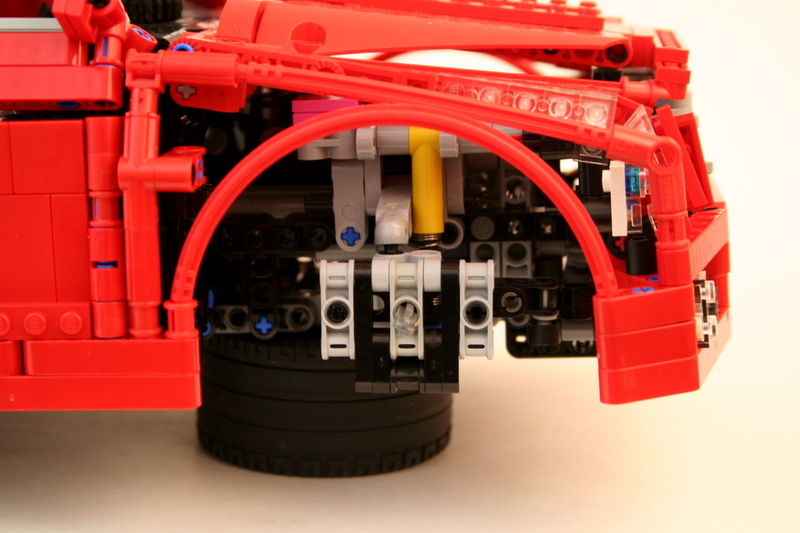 Something with all the features that are to be expected in the LEGO Technic Community. You know what they are; suspension, a gearbox, opening doors, a working engine, steering, and something fast looking. Probably red. It was time to test my chops and throw my hat into the ring. It has been a long time since I have built a supercar. While I enjoy many of the cars others make, I long for exceptional creativity in suspension design, gearboxes, and body style. It was time for me to build another one and contribute to these areas. About two years ago I set out to create a six speed gearbox that would have a more realistic gear change movement. I tried linkages, springs, and so many gears. In a bit of a breakthrough, I offset the two outside changeovers vertically by 1/2 stud. This allowed for the changeover lever to connect all three changeovers as it rotated from a single center pivot point. Once this design was completed, it needed a home. I have a preference for sedans rather than coupes. Plus too many two-door supercars have been created. Forgive the slight nationalism, but I thought it would be fun to do an American sports sedan, so a Cadillac was the best choice since the demise of my beloved Lincoln LS. The ATS was new, and at the scale would be a little more manageable than the CTS. I worked a little on the scale of the car. Some parts would be a challenge to convey the look, but I was ready to start building. I started with the front suspension. The new suspension arms allowed for a short/long arm setup. The two different arm designs allowed for a increasing negative camber as the suspension moved through its travel. Additionally, the pivot points on the steering hub allowed for a kingpin inclination to provide an improved caster angle. Finally, I added Ackerman geometry to the steering link. After some work mounting the suspension, and the rack and pinon steering, I had the front suspension done. The rear suspension was more simple, but still had some unique features. While the real ATS uses a 5 link setup in the rear, I was not too impressed with the results I came up with as too much flex was found at the wheel. 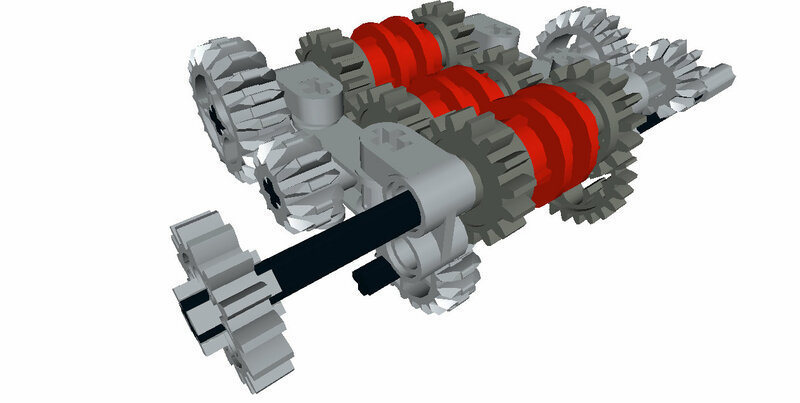 I started with a transversely mounted limited slip differential that I have used before. This connected directly to the two half-shafts for the rear wheels. I applied a short/long arm setup for the rear suspension so the tires would keep their contact patch as the body would roll through a corner. Like the front, this created increasing negative camber as the suspension moved through its travel. Normal in real cars, not often replicated in LEGO. Tying all of these parts together was a little bit of a challenge. I wanted the steering wheel to be connected to the steering as well as a HOG knob on the dashboard. In addition, the doors, trunk, and hood should all open. Naturally, the car had to have a spare tire, and various engine options which could be easily removed. The chassis had to be stiff enough for the suspension to function well. Packing this all together took some time. About 9 months, but who is counting? But what took the most time was the body work. This is the part for which I have little motivation, and the important part that would identify the car as an ATS. I had a lot of work to do. And my palmares have not trained me well for this task. After major parts were placed, and the dimension were set (37 stud Wheelbase, 60 stud Length, 25 stud Width), I worked on one section at a time. As the front bumper was part of the chassis, this part was developed early. As did the rear bumper. The headlights are unique for the ATS, so this was done early as well. After the roof was placed I worked on the trunk, which came together rather easily. I worked on the hood of the car, and after two designs I was happy with the result. I then worked on the grill, and after tinkering with a couple of SNOT techniques, I was able to get most of the distinctive Cadillac grill in my design. Then off to the doors. I made seven designs. Most sedans these days have various creases that identify their sedan as different than any other sedan. You will notice the ATS has two, one on the bottom that rises slowly to the rear, and one midway up to the windows that moves along the length of the car from the hood to the trunk. The top line was accomplished by having the angle for the windows start a little lower on the front door and higher by a 1/2 stud on the rear door. The bottom crease was added by attaching some angled plates to the bottom of both doors, which cant slightly inward. Finally, both doors have an upper pivot point that is 1/2 stud inboard to bring the upper part of the doors toward the center of the car. Once I got a design I liked, I had to bring it all together to make sure everything fit well. I adjusted the roof, modified the hood, tightened up the dashboard connection to the doors, and made some changes to the rear quarter panels. There were still some areas where improvement could be made, but I was running out of ideas. I was pleased with the result. Pleased enough to say I was done. All in all, I was pleased with the result of the car. As this is my first studless supercar, I was happy with how it turned out. The functions were up to my standards, and nothing was compromised as the car came together. While I was overwhelmed with the bodywork, I was pleased with how it turned out. Because it took me a long time to get it to work, it may be a long time before I do another one. I was happy I did a sedan, and hopefully a new moniker can begin in the LEGO community. #supersedan.